During the interwar years, the leadership of the Japanese Navy split over the naval disarmament treaties. The Fleet Faction (Kantai-ha) opposed any restrictions on construction by the Japanese Navy while the Treaty Faction (Jōyaku-ha) favored the treaties. The Fleet Faction rejected the pragmatic view of the Treaty Faction and condemned the naval disarmament treaties as an affront to the prerogative of the divine Emperor to command as large a navy as he wished. The Fleet Faction also argued that the 5:5:3 battleship ratio imposed by the treaties was insufficient to guarantee parity in Japan's own waters with an attacking Western fleet. The leaders of the Fleet Faction included Kato Kanji (Kato Hiroharu), who had been an aide at the Washington conference: When the Japanese Navy expended two battleships as targets on 8 July 1924, in compliance with the treaty, he was overheard to say that "From this day on, we are at war with the United States" (Larrabee 1987). During 1933-1934 Kato helped engineer a purge of leading Treaty Faction officers, transforming the Japanese Navy from a highly Westernized and pro-British service into "a disturbed organization riven with dissent" (Larrabee 1987). 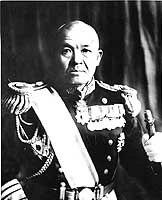 In 1934, the nominal leader of the Fleet Faction, Prince Fushimi, advised the government to withdraw from the Washington treaty system. Ambassador Grew later reported that a Japanese Army officer had given a speech at Kobe in which he stated that "American duplicity during former naval conferences degraded Japan, and this insult to the Imperial Navy must be avenged" (Larrabee 1987). The leaders of the Treaty Faction served in high positions in the years immediately preceding the outbreak of war in the Pacific, particularly within the Navy General Staff, and they were able to check the power of the Fleet Faction until shortly before war broke out. The most senior commander identified with the Fleet Faction who was still on active duty in 1941 was Nagumo Chuichi, who led the Pearl Harbor Strike Force.